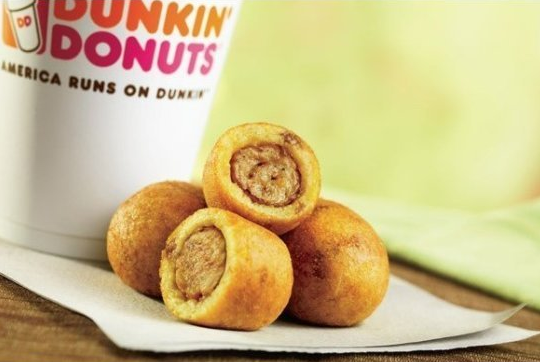 Dunkin’ Donut’s Sausage Pancake Bites! A piece of sausage is rolled up in a strip of pancake, fried, and presented with faux maple syrup, aka artificially flavored high fructose corn syrup. At 100 greasy calories a bite, these can do some serious damage! While certainly not the worst of the fast foods we’ve posted about, this one is far from healthy. Go for the egg and cheese wrap, at 180 calories, or go all for a donut, at 240-350 calories each and enjoy it! We loved this video, with musicians using ipads and iphones as instruments. Enjoy this iConcert from the North Point iBand as seen on Gizmodo.com. Here is a novel way to wrap those last minute gifts. Attach a pull cord made of ribbon, so that the paper separates down the middle effortlessly! Tape one end of narrow ribbon to the box, and wrap it around the short side of the box at least 2-3 times. Cut the ribbon leaving a 6” long “tail” extending off the end of the box. Wrap the package normally, leaving the tail hanging out of the center of the paper. On the outside of the package, fold the ribbon tail back, and cut 2 small slits on either side, so that the paper will rip in that direction. Be careful not to tape the ribbon on the outside of the box. When the recipient pulls the ribbon, it will rip the paper neatly as it unravels. Giving to charity is certainly a great way to celebrate the holidays, but even in the best situations, one size doesn’t always fit all. That’s why we love the Causes Gift Card, which allows the recipient to choose the charity of their choice. The cards are available in denominations of $25 and $50, and can be purchased through Safeway and Vons stores throughout California. Gift givers purchase the cards (yes, they are tax deductable too!) and the person receiving it can go on-line to causes.com to select from over 1 million non-profit organizations. The money is then donated through the Network for Good. Causes then sends the cardholder confirmation of their donation. Causes is currently working towards enabling on-line sales of the cards in the future. What a perfect way to give and give back at the same time. Our favorite charity is www.cycleforsurvival.org, a wonderful organization that gives 100% of all funds to research to cure rare forms of cancer. The French are among the world’s biggest consumers of bottled water, generating an estimated 262,000 tons of plastic waste each year. In an effort to get locals to drink more tap water, Eau de Paris, the city’s public water company, has set up a water fountain that dispenses both regualar and sparkling water. The fountain is located in Jardin de Reuilly, a park in eastern Paris. 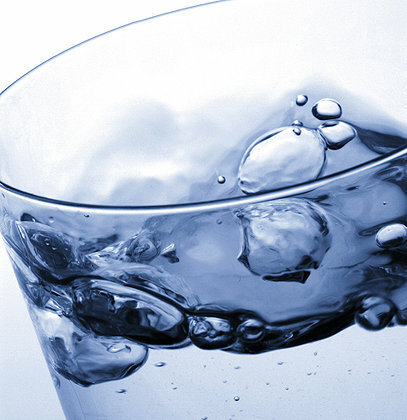 It dispenses tap water injected with carbon dioxide and chilled to a desired temperature. The water is sourced from underground springs, as well as the Seine and Marne rivers. The idea behind the fountain is to boost the image of tap water, and show that it is a safe and ecological alternative to bottled water. Wouldn’t it be great if all major cities followed suit? Artist Jim Campbell’s work fuses fine art with emerging technology. His current work, Scattered Light, is comprised of nearly 2000 LED lights, encased in standard light bulbs and suspended above the central lawn of New York City’s Madison Square Park. The 80’ long installation features a 3 dimensional matrix of lights, programmed to turn on and off in a way that emulates human figures moving through the field of light. A smaller piece, entitled Broken Window, expands on this concept, and uses the light to play across a surface of glass cubes. Voices in a Subway Station, is a symphony of light, using glass lit tablets to engage in conversation across the park. Campbell’s 3 light based sculptures are being shown in Madison Square Park until February 11, 2011. 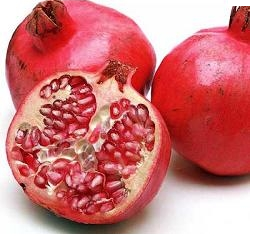 Pomegranates are an antioxidant filled winter fruit that is as tasty as it is healthy. The edible part is the seeds, which add a sweet crunch to salads, cereals and yoghurt. Getting the seeds out, however can be a challenge. Pomegranate seeds are worth the trouble, if you know a few tricks that make getting them out a breeze. Cut the pomogranate into quarters. Break off sections of the fruit to expose clusters of seeds. Using a fork, gently scoop out the clusters, removing any bits of pulp that might come off as well. Be careful not to crush the seeds. The red juice stains, so protect your clothing and light colored countertops! I have also read that you can soak the sections, and the seeds come out easily in the water.